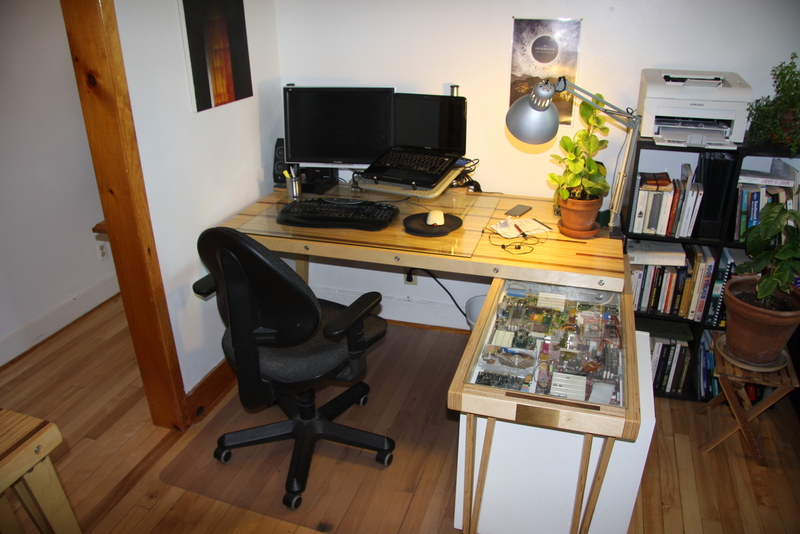 For a long time I had dreamed of the perfect desk and finally last summer I got around to actually building it. 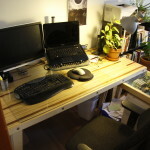 Having come across pieces of furniture made from laminated birch plywood grain-side up, I opted to use that technique for the desk rather than making it from solid planks. 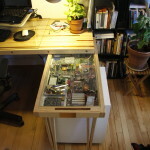 Using leftovers, I also built a liquor cabinet in much the same fashion. 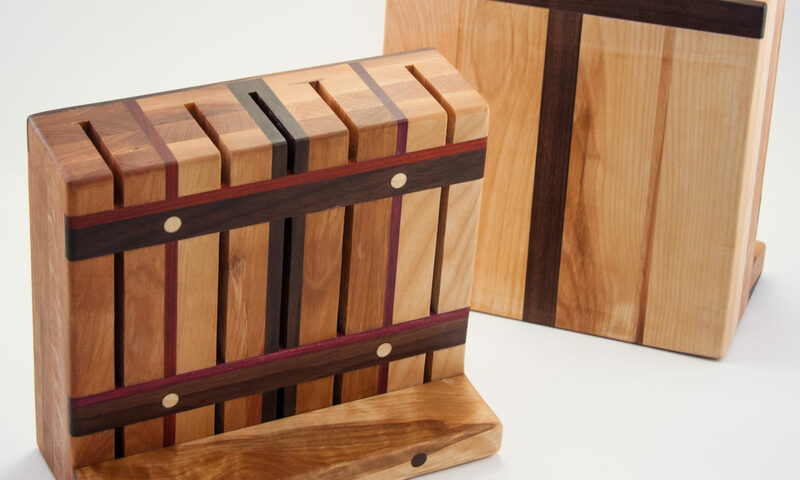 The surface features inserts of walnut, apple and padauk and the beams are held together by compression using threaded rods. 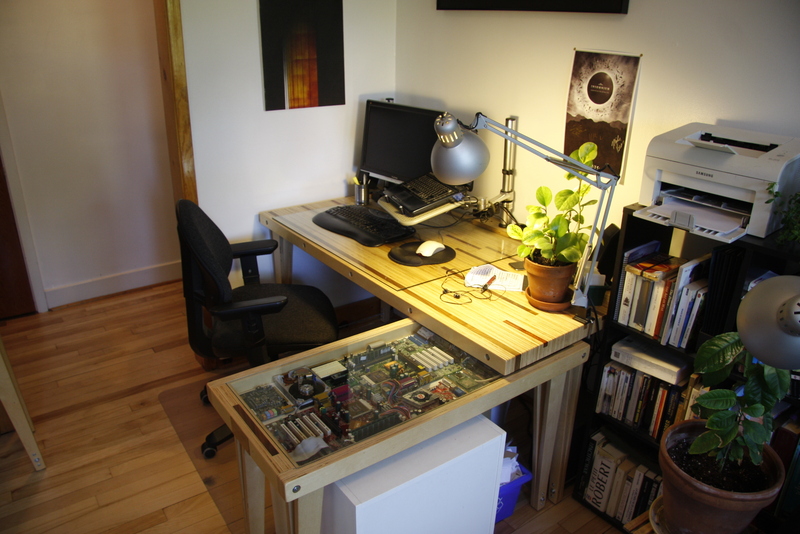 Adjoining the desk is a side table also built using plywood but this time held together using glue. The side table has been made hollow to accommodate some computer parts in a fashion similar to that coffee table I built some years ago. 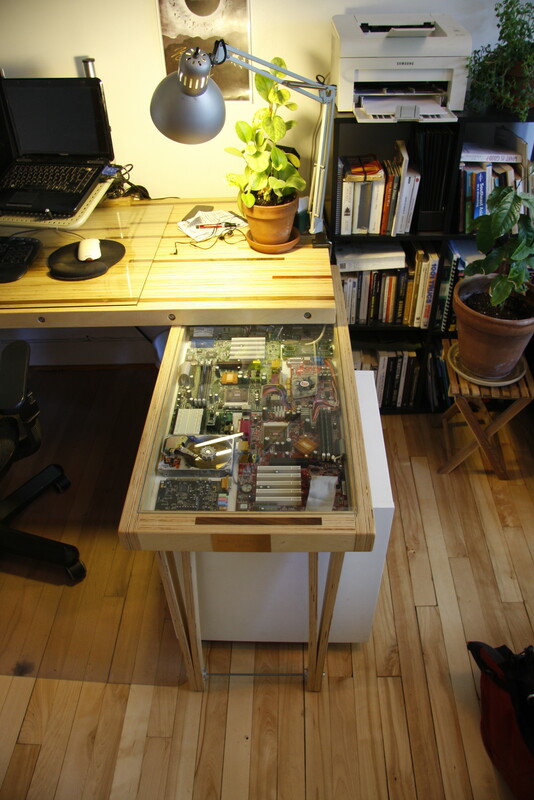 To manage all the cabling, I simply reused a system I had put together for my first desk. Now for the actual experience of making that projet into reality, it was much much more difficult that originally expected and ended up taking a lot more time. 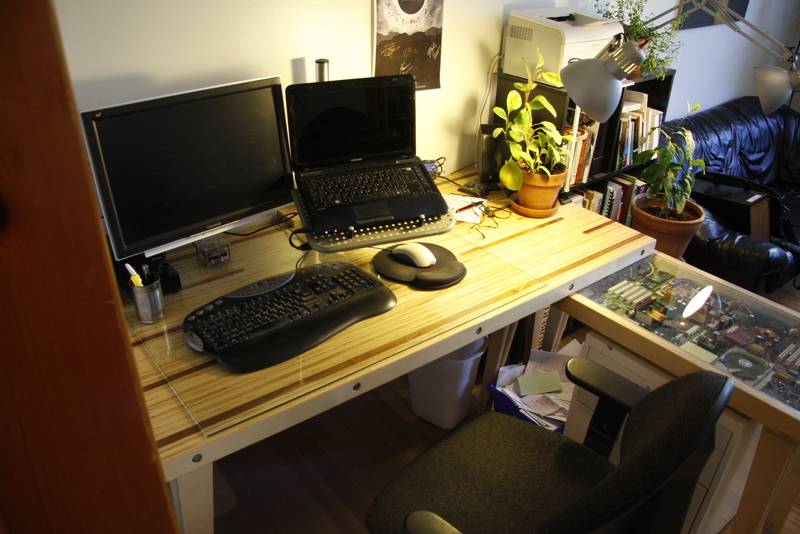 The surface of the desk is actually assembled using beams composed of three planks of plywood screwed together and then planed. Thinking that the beam would sit square once assembled by alternating the saw cuts to offset any errors, I omitted to joint the beams before planing them. In the end they didn’t and I ended up with many crooked beams and a wavy desk surface. 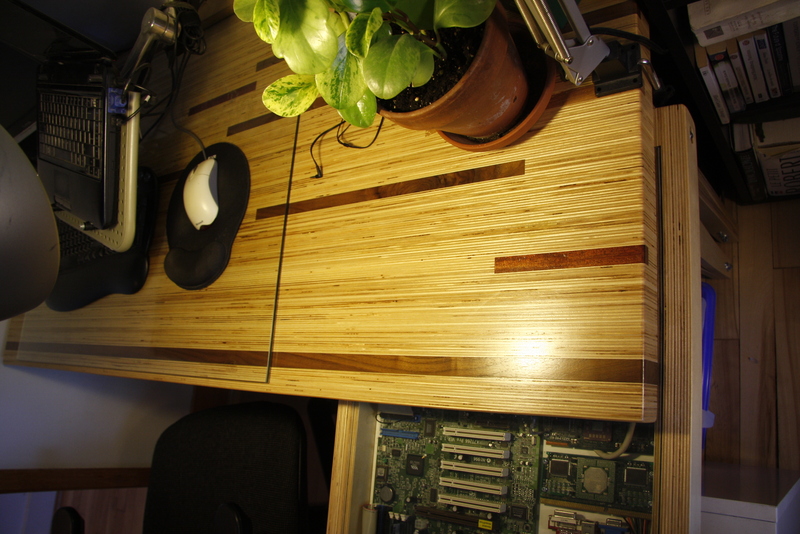 Plywood is not very rigid, that I was aware of, but it’s also quite compressible. In the end, my desk was not thick enough to account for that so once assembled and taught by the threaded rods, it would start bowing after a while. I managed to make the surface sort of straight using shims, but it’s still far from perfect. I’m also not exactly satisfied with the look of the legs, so I plan to revisit this project in the future to build metal legs and a frame to straighten it out. 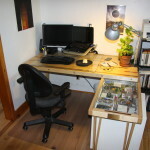 In spite of all the challenges of building this desk, I’m still very happy with the way it came together. 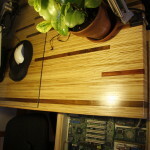 I don’t think I’ll be reusing plywood again for woodworking projets, but I certainly gained a lot from the experience. Tu fais ça chez ton père ou à ton appartement? Quels outils tu utilises? Chez mon père. Les principaux outils utilisés étaient scie ronde, banc de scie, planeur, perceuse à colonne et sableuses. Ton père est bien équipé! Il fournit l’espace, mais les outils m’appartiennent pour la plupart.